RALEIGH, NC--(Marketwired - Apr 10, 2015) - bobble®, the leader in smart and stylish drinking solutions, today announced the introduction of presse by bobble, a clever one-cup-at-a-time coffee brewer that lets you brew, press and go for the perfect cup of coffee every time. presse by bobble continues the company's mission to reduce the outrageous waste caused by single serve, disposable beverages and beverage systems. This launch expands bobble's offerings beyond water filtration and into hot beverage solutions with a sleek portable design. presse by bobble combines manual immersion brewing with reverse flow filtration for gourmet coffee in just three minutes without the need for plastic pods or paper filters. The unique micro-filter technology separates grounds from finished coffee, which prevents the over-brewing or bitterness commonly associated with French press style brewing. 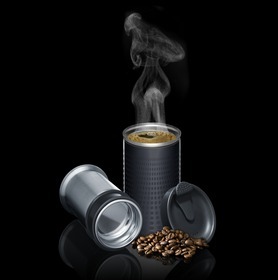 The two-piece stainless steel design also creates triple-wall insulation to keep coffee hot for hours. "At bobble, our mission has always been to reduce the outrageous waste of single serve, disposable beverages by providing consumers smart and stylish reusable drinking solutions. presse by bobble is a natural extension of that mission," said Brian Berklich, Marketing Director of Seventh Generation Ventures. "A great cup of coffee should leave you feeling satisfied and energized, not guilty about the needless waste your convenient cup is creating. presse by bobble not only provides a convenient, on-the-go option for coffee lovers without creating plastic pod waste, but also makes the process of brewing gourmet coffee simple." Newly re-branded, presse by bobble was a part of the recent Gamila Products, LLC acquisition by parent company, Seventh Generation Ventures. presse by bobble is available in two color options (black and silver) on www.Amazon.com and www.pressebybobble.com. Founded in 2009, bobble® is a registered trademark of Seventh Generation Ventures, Inc. and based in Raleigh, North Carolina. The brand lives out its mission to reduce the outrageous waste caused by single-serve, disposable beverages and beverage systems, with products that are sustainable, stylish alternatives to single-serve plastic water bottles and coffee pods or filters. For more information on bobble, visit www.waterbobble.com.